NORTH BAY, Ont. 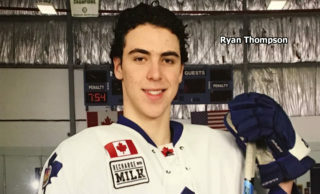 — The injury-riddled North Bay Battalion, suddenly sitting outside an Ontario Hockey League playoff spot, plays host to the Guelph Storm at 7 p.m. Thursday in the first of three games this week. North Bay has a won-lost-extended record of 19-27-4 for 42 points, fourth in the Central Division and ninth in the Eastern Conference, one point behind the Niagara IceDogs, who lost 4-3 in overtime Tuesday night to the host Kitchener Rangers, garnering a point in the process. The Battalion visits Niagara, which holds the last conference playoff berth, Saturday night and the Oshawa Generals on Sunday night. The Troops have two games in hand on the IceDogs. Guelph is 17-27-5 for 39 points, last in the Midwest Division and Western Conference. 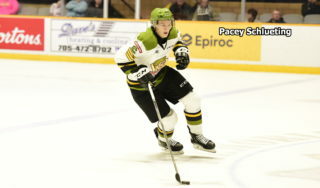 The Battalion lost 7-4 at home Sunday to the Sault Ste. Marie Greyhounds, surrendering five unanswered goals, including an empty-netter, in the last 8:26. The Troops are 1-5-1 in their last seven games and 4-15-2 since a 6-0 win Dec. 8 over the visiting Flint Firebirds. Overager Brent Moran gave up six goals on 41 shots before rookie goaltender Mat Woroniuk played the final 1:24. It was the second straight game in which Woroniuk relieved Moran in the third period, the other a 4-0 road loss Friday night to the Mississauga Steelheads. 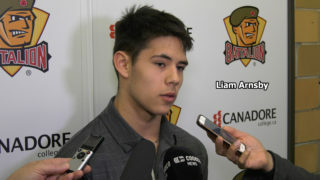 The Battalion has been without four defencemen in recent weeks. Cam Dineen underwent knee surgery in December, Brady Lyle suffered a cut to his right leg Jan. 12, Riley Bruce incurred a shoulder injury Jan. 15 and Eric Allair has battled a back problem. Butler said Lyle may see action this week. 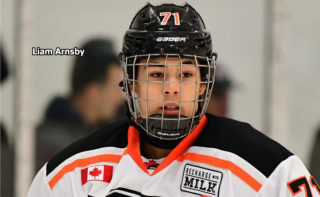 North Bay has used winger Daniel Walker on the blue line and has called up three rearguards from the Powassan Voodoos of the Northern Ontario Junior Hockey League. Eric Nagy has played six games, Dayton Murray four and Bo Peltier three. “Nagy’s done a pretty good job, and I think Bo really gave it as much as he could,” allowed Butler, who said Nagy likely will face Guelph. The Battalion has had four regular defencemen available, in Zach Shankar, Mark Shoemaker, Adam Thilander and Jesse Saban, but they’ve been pressed into extra minutes and unfamiliar roles. 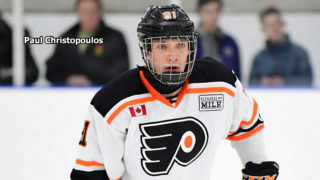 Left winger Isaac Ratcliffe leads Guelph in scoring with 23 goals and 19 assists for 42 points in 48 games, while defenceman Ryan Merkley is second with seven goals and 29 assists for 36 points in 43 games. 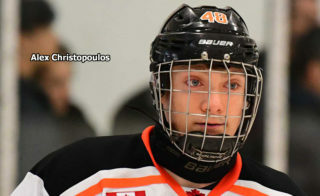 He was the first overall pick in the 2016 OHL Priority Selection from the Toronto Jr. Canadiens minor midgets. Right winger Givani Smith, the OHL leader in penalty minutes with 110, is third in team scoring with 20 goals and 14 assists for 34 points in 46 games. Centre Brett McKenzie is the Battalion’s top points producer with 54, from 24 goals and 30 assists in 49 games, and right winger Steve Harland ranks second with 22 goals and 27 assists for 49 points in 50 games.